"This is a picture I took of my puppy, Sophie, at 4 months old. 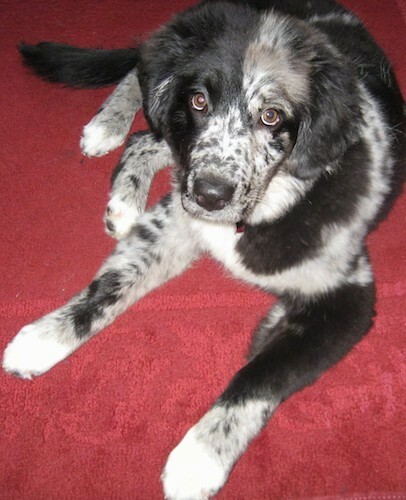 She's a Newfoundland-Australian Shepherd mix. She is a lover and she is very attached to her "mommy and daddy". She isn't much of a chewer. She loves stuffed toys especially if they have a squeaker. She Loves water!!! She inherited webbed toes from her Newfoundland father and any puddle bucket or stream she can get to she is in! But that also means she enjoys to play in her water dish and makes puddles in our kitchen. She gets daily walks and she loves spending time outdoors but is an indoor dog that sleeps in our bed with us. I think that she is the perfect mix of breeds. I wouldn’t trade her for any purebred!"